A Tonk's Tail... err, Tale...: Happy New Year! As 2013 ends and the new year begins, we wanted to take a moment to thank you for taking time out of your day to visit us. We so enjoy sharing laughter, fun bits of trivia, a little geeky science and a whole lot of silliness with you! And we look forward to more of the same in 2014. We wish you happiness, health and all good things in the coming year. Happy New Year to my favorite across-town kitties! 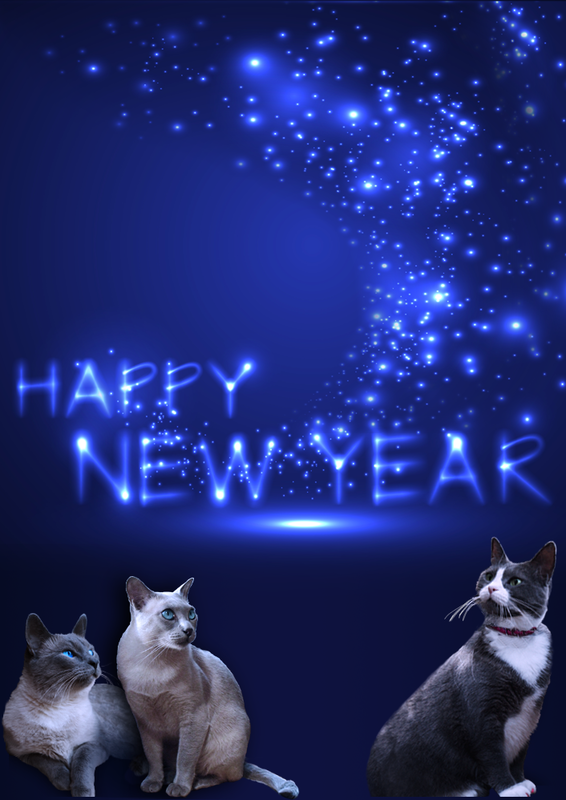 Happy New Year to you, dear furriends! What a pretty picture! Happy new year to all of you! Happy New Year!!! We love all the interesting posts you do and always look forward to reading your blog! May 2014 be a wonderful year! Happy New Year! All the best to you and yours for a great 2014! Happy new year, kitties! I hope 2014 is AWESOME! HAPPY HAPPY NEW YEAR TO YOU FURIENDS!!! Happy New Year to yous and may 214 be the bestest year ever! A very happy New Year to all of you! Here's to a great New Year! Such a pretty picture! Happy New Year's friends!